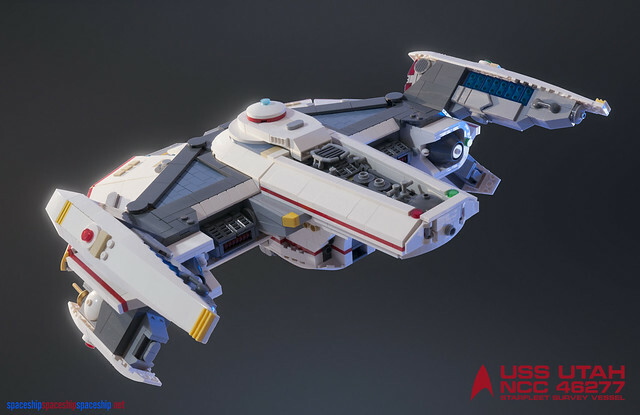 My eye was immediately drawn to this model of the outrider by foxprimus101, a subject that’s always appealed (this isn’t Dash Rendar’s, it’s one from Rebels apparently). The builder has made good use of the new 4×4 macaroni tiles to give a nice smooth curve to the main hull, although the eye on the front of the cockpit is a bit weird. There were printed pieces on the official midi-scale Falcon set, but they must be pretty rare. 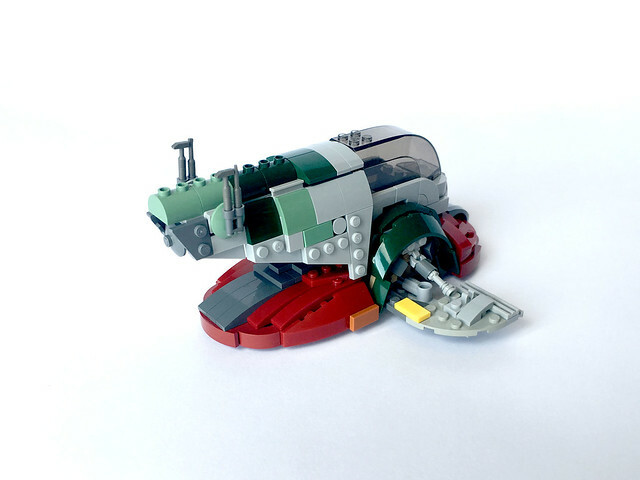 You can’t go wrong with Slave 1, and this is a sweet midi-scale rendition by Januarybegan. 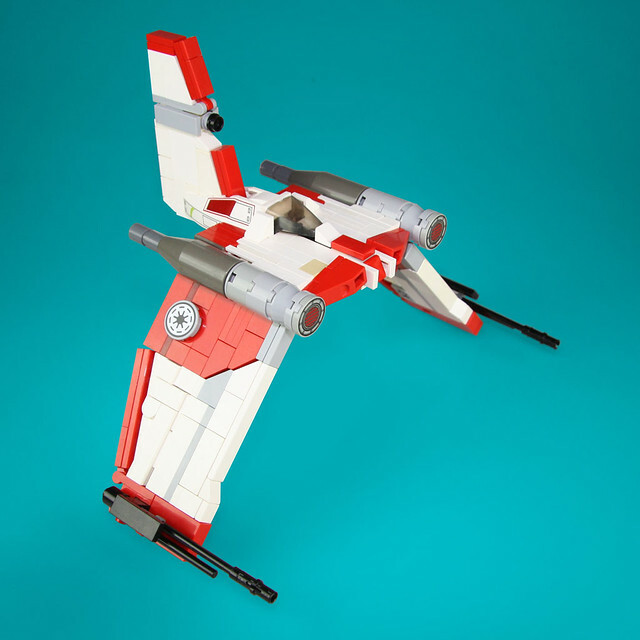 Interestingly, it seems to use very similar construction techniques as the big UCS model, and pretty much the same colours throughout. You can imagine a printed 1×2 tile with the unlucky Han Solo to put in the hold. Lastly this V-22 Torrent by Bartosz Sasiński is excellent and uses some awesome techniques to build the colour blocking across the wings, as well as some judicious use of stickers. I can’t work out what piece he’s used for the cockpit but it’s a very clever construction (and possibly quite fragile!). Head on over to FBTB.net and vote for your favourites. Whatever else you may think about Rogue One, you’ve got to agree they did a nice job putting in references to the other films and TV series. One that got fans of the Rebels TV series purring like kittens was the scene where a Hammerhead Corvette rams a Star Destroyer. 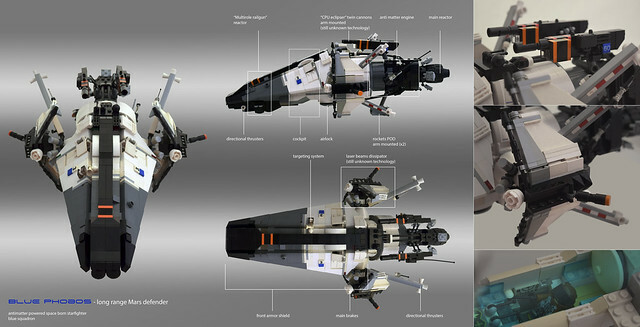 Cue this LEGO version by Daryl Ng. 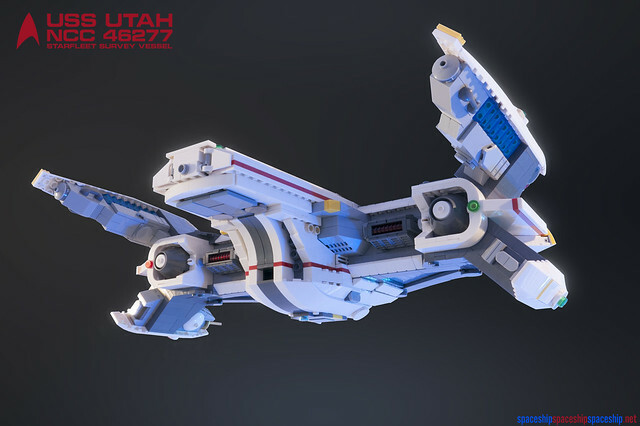 Daryl’s done a fantastic job of building this as a SHIP (90cm long = 112 studs) making great use of curved panels and 4×4 macaroni pieces build the cylindrical parts of the body. Orange parts duplicate the colouring from the movie / TV show and of course the eponymous head is suitably hammery. I’m not a massive fan of the design, but it does feel firmly like a product of the same technology as the original movie’s Blockade Runner. Daryl’s put it on LEGO ideas so you can vote for it to be an official set, something it stands literally NO chance of becoming; but you never know we may see a more suitably scaled set one day. 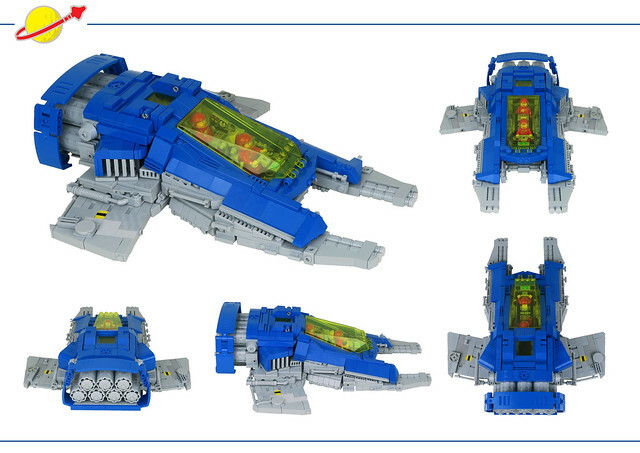 When 70816 Benny’s Spaceship appeared a few years back, fans of Classic Space rejoiced because a) LEGO made an official Classic Space set! 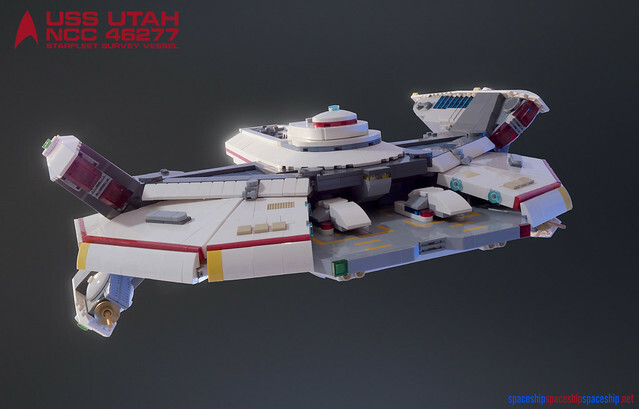 and b) it had a fantastic yellow cockpit windscreen piece which made a whole new slew of Classic Space MOCs possible. 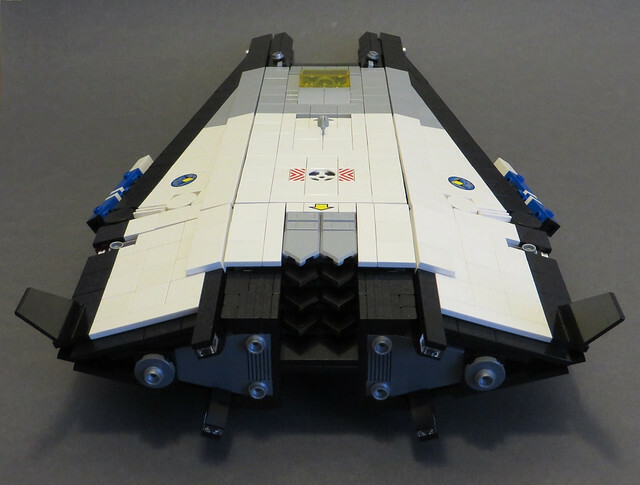 Joining their illustrious ranks is the LL-527 Rapier class fighter by Wami Delthorn. Wami’s mounted the window upside down for some extra fun, which affords the pilot and navigator/weapons guy/freeloader fantastic views of wherever they’re swooshing next. He’s also used all sorts of angles to build up the impressive shape of the craft, from the cockpit itself leaning at an angle to body, to the wings canted just off the right angle and those neat air intakes scooping in above them. I also really like the way he’s recycled touchstones of the Classic Space design formula into such a slick and modern build, e.g. the yellow window behind the cockpit, and the blue spoiler fin which wraps around the main engines and cleverly uses technic pieces to give it a smooth, modern look. He’s also given it a really neat landing pad so it’s got somewhere to call home between swooshings. Some time back I blogged a spaceship that was clearly based on a lifting body concept, like a more advanced futuristic take on the aborted X-33. 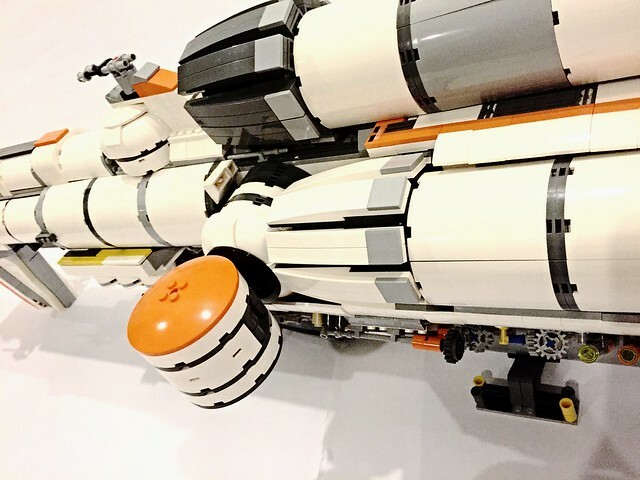 Builder Nick has taken that concept to the next level with his SAB S-44 Kestrel, evolving a similar shape into a further-future Starfighter. It’s the black and white colour scheme that roots the model firmly in a plausible future. In fact, the covering of tiles seems to echo the tiles that made up the heat shield of the space shuttle. The shaping is also excellent, with an almost seamless approach resulting in a really impressive wedge shape across multiple axes. 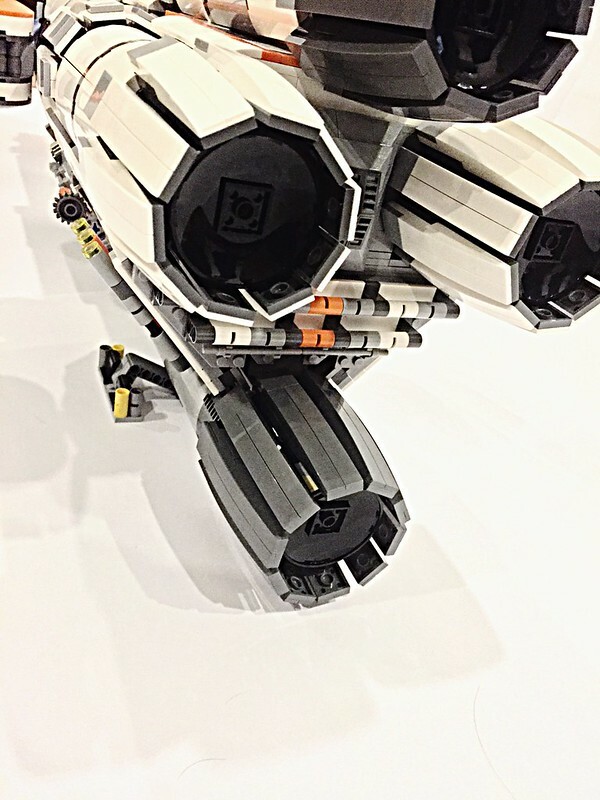 There’s some great details too, and I love the RCS thruster clusters built into the corners; and the Nexo Knights shield pieces used to build the engine exhausts; which is reminiscent of a stealth fighter. Extra marks for the cool loadout shoot too, and for using a Classic Space canopy. Having built a number of smaller Star Trek models I wanted to build something larger where I could go to town on the smaller details and colouring rather than just get the overall shape. This fantastic concept design by Ryan Dening had been in my ideas folder for years, and I thought the faceted hull looked eminently buildable. 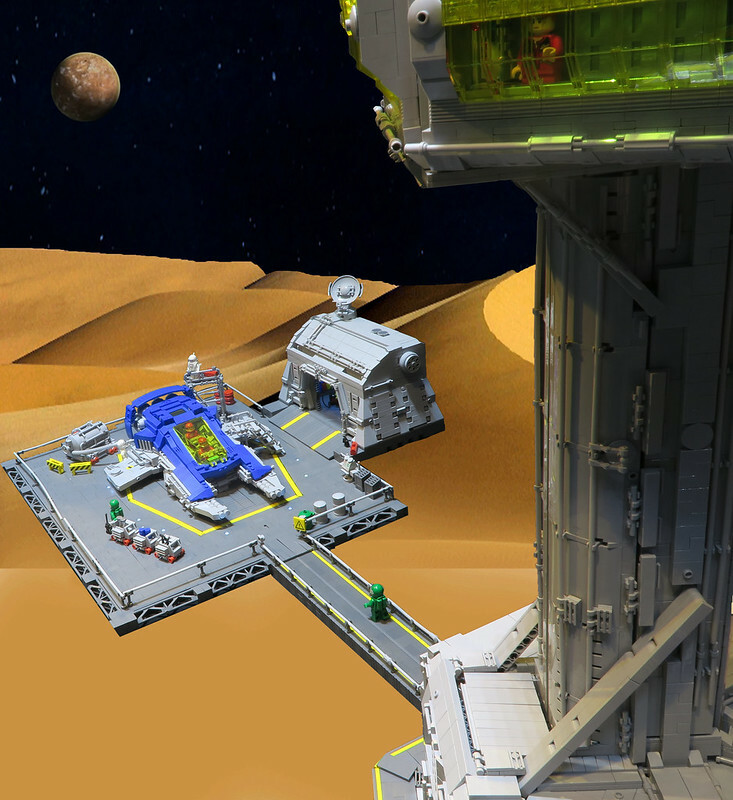 I had also wanted to build a large microscale shuttlebay into a model for some time, so I photoshopped the one in the concept really quickly and this became my main guide. I ended up following that quite closely, tweaking the details mainly and eliminating the raised area behind the bridge. I was really pleased with the angles of the hull and used some neat techniques to build them. I also worked really hard to get the dark grey section to carry seamlessly onto the warp “wings” – the sand blue inset was just an added bonus! I posted a WIP online and did a final round of changes following some great feedback, making the hull more predominantly white and changing the lower weapons pods to sensor pods, with gold dishes as a throwback to 60’s Trek. 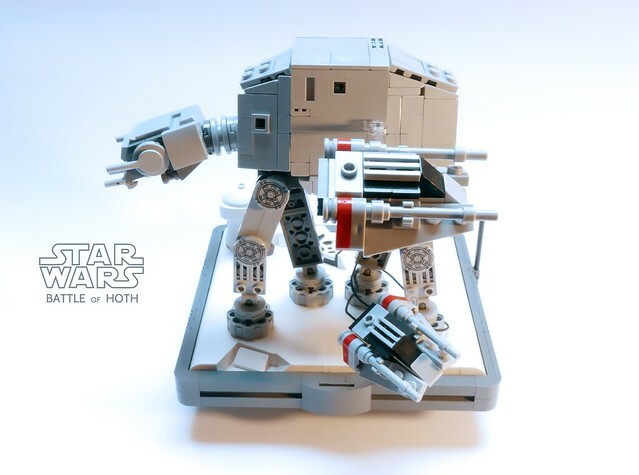 It’s surprisingly sturdy and the central core means the entire model can stand on a single rod of technic beams. I also designed a new stand that angles the model on two axes so it’s artfully presented at a swoopy angle. 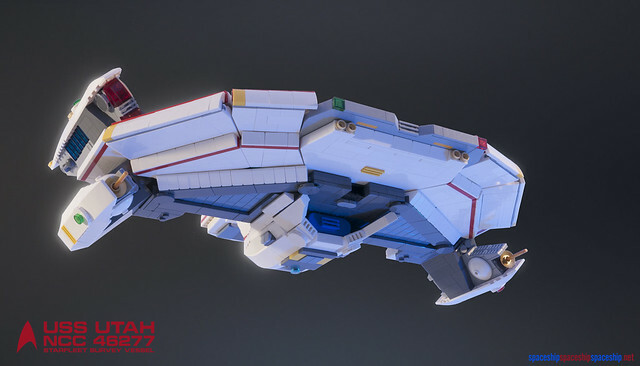 My previous model took 10 months to build, but I knocked this out in four; and the process has been surprisingly straightforward and very enjoyable! 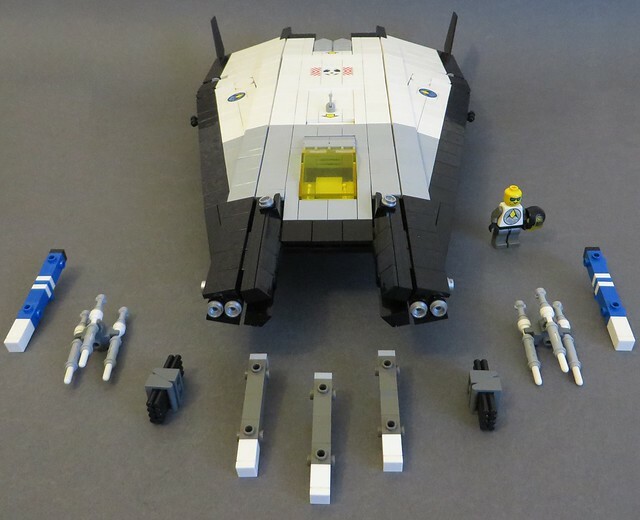 File this under “I didn’t realise this was LEGO until I clicked on it”. 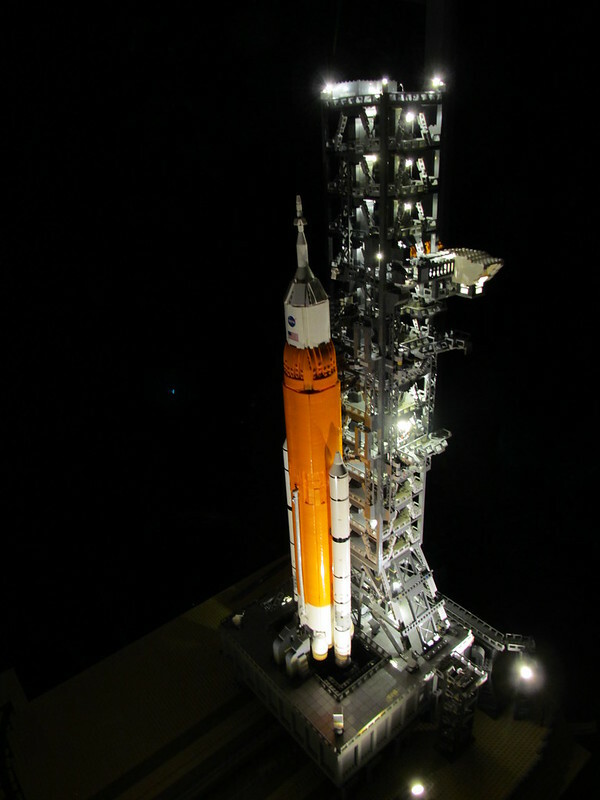 Builder Lia Chan has made this fantastically detailed large scale model of the SLS – the “Space Launch System” proposed replacement for the Space Shuttle which will (possibly) ferry future crews to earth orbit, the ISS and the moon. She’s also photographed the model at night and with fantastic interior lighting on the gantry, which is what’s sold this so readily as being a real photo rather than a LEGO model. In fact the gantry is the larger and probably more complex build, with every little handrail and access area faithfully modelled. Politics means it’s dubious whether the SLS will ever take off, but Lia’s excellent model is already out of this world! Sorry, that terrible pun will have to tide you over while we wait for LEGO’s own, official, ideas set of the Saturn V rocket, due to be announced soon.